VERDICT: Seven up! Diamonds up! AFC Rushden & Diamonds are going up! The job was completed in devastating fashion as Andy Peaks’ team hammered Aylesbury FC 7-1 at a rainswept Hayden Road while third-placed Hartley Wintney went down 1-0 at Kempston Rovers to confirmed Diamonds’ promotion to Step Three for the first time in their history. Peaks and his players, as they have done for most of the Evo-Stik South League East season, delivered when it really mattered. They tore into their visitors, particularly in a one-sided second half and finished them off to leave no questions unanswered. The fans were singing in the rain, the players were clearly enjoying the moment and Peaks will no doubt have be an extremely proud man as he watched on. 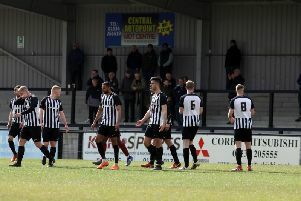 The play-off defeat at St Ives Town two years ago hurt, the loss at Witton Albion in the semi-finals last season was accepted but this time Peaks wanted no mistakes. With two automatic promotion places up for grabs, he set his stall out to get the job done. The aim for the season has been executed almost to perfection and they may yet add the title to round things off nicely. But, for the moment, everyone associated with the club should savour another promotion. And there could be no arguments at the way it was completed. After a low-key start, Diamonds burst into life with the crucial opening goal just past the quarter-hour. Luke Fairlamb, as he has all season, was the livewire on the wing and he skipped past a defender before driving the ball across where Ben Farrell arrived on cue to hammer into the roof of the net. That settled things down and, after Sam Brown had an effort cleared off the line, the lead was doubled when Joel Gyasi’s inswinging free-kick from just inside the left touchline caught the wind and sailed over Ashley Jenkins’ head and into the net. Brown so nearly had a moment to savour when he beat four players in a mazy run, only to see his final effort blocked. But a sustained period of pressure followed with Aylesbury’s Kris Clark in the right place to head away the danger after Spencer Weir-Daley had lofted the ball over Jenkins after breaking clear. Liam Dolman headed just over from a Gyasi corner and Farrell sliced wide of the target as chances continued to arrive. But Aylesbury clearly hadn’t read the script in full and a moment of sloppiness in the home defence saw them fail to clear their lines and Kieran Schmidt fed the ball through to David Pobbe who fired home to make it 2-1. Diamonds didn’t panic though and they restored the two-goal advantage just before half-time when Ryan Robbins charged away in the right channel. Jenkins half-saved the striker’s effort but Farrell was there to pick up the pieces from close-range. Jenkins made a good save from a well-struck Ross Oulton effort before the break but the hosts continued in the same vein after the break. Weir-Daley missed the target with a free header but Farrell made it a night to remember when he completed his hat-trick, following in to score after Jenkins could only parry Robbins’ strike. But there can’t be a party without Liam Dolman and the Diamonds captain got in on the act with a thumping header from a corner to make it 5-1. That wasn’t it by a long shot, however. Peaks threw on Ben Diamond and Tom Lorraine in place of Weir-Daley and Robbins and it was Diamond who had the final say. He slid home number six after Jenkins came flying out of his goal and then made it a magnificent seven with a good finish across goal. Lorraine was only denied by one goal-line clearance and another good block as Diamonds threatened to rack up double figures. This was a job not only done, it was completed in brutal fashion as Peaks’ players ensured no-one was left in any doubt. The final whistle sparked the wild celebrations with the wind and rain sweeping across the ground being largely ignored as the players and supporters savoured the moment. Diamonds: Heath; Punter, Dolman, Brown; Gyasi, Westbrook, Oulton, Farrell (sub Ford, 76 mins), Fairlamb; Weir-Daley (sub Diamond, 70 mins), Robbins (sub Lorraine, 70 mins). Subs not used: Ashton, Westwood. Aylesbury: Jenkins; Haye, Clark, Feyi, Brown; Njogu, Neale (sub Scott, 65 mins); A Ball, Touceda (sub Woodfine, 71 mins), Pobbe; Schmidt. Subs not used: Banert, D Ball, Ashley. Goals: Farrell (16 mins, 1-0), Gyasi (20 mins, 2-0), Pobbe (33 mins, 2-1), Farrell (43 mins, 3-1), Farrell (61 mins, 4-1), Dolman (64 mins, 5-1), Diamond (74 mins, 6-1), Diamond (80 mins, 7-1). Bookings: Feyi, Neale, Pobbe (all fouls).